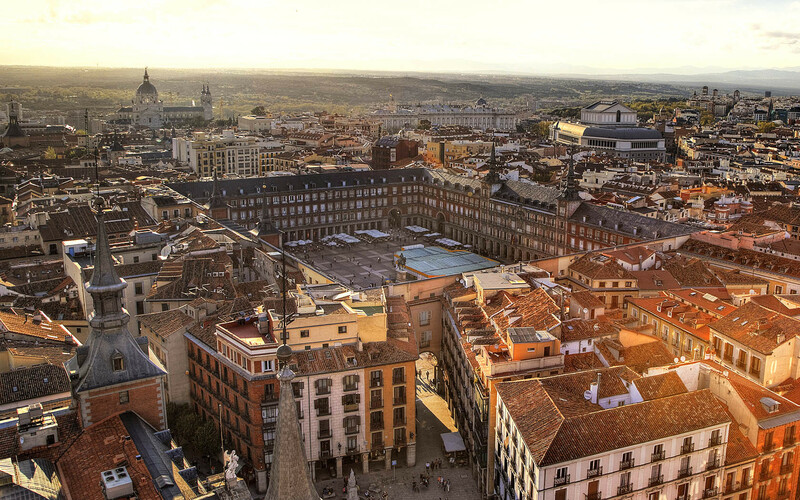 Madrid is a gorgeous city with a years old history. Besides the great bars and loud music it has one of the best collection of art which is collected in madrid museums. Velasquez, Picasso and many more, check it out, it's absolutely fantastic! I arrived to Madrid and didn’t know what to expect since it was the capital! Some people say they like Barcelona better and others say Madrid. Madrid is more Spanish because of the pride they take in being Spanish vs. Catalonians who want Cataluña to be their own country. Madrid is a very great and fun city! Home to Real Madrid and Atlético de Madrid… There are a lot of great museums in Madrid. 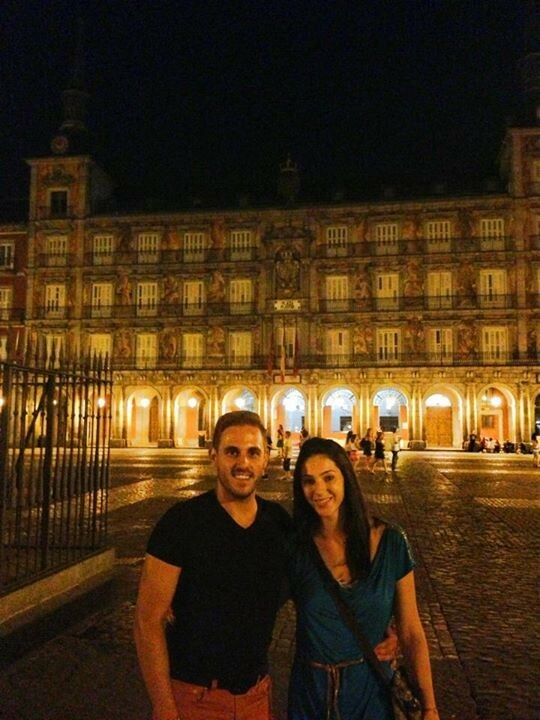 Plaza Mayor- This is a very fun place to go! Surrounded by bars and tapa restaurants it is always busy! There are lots of streets around this area with fun restaurants. 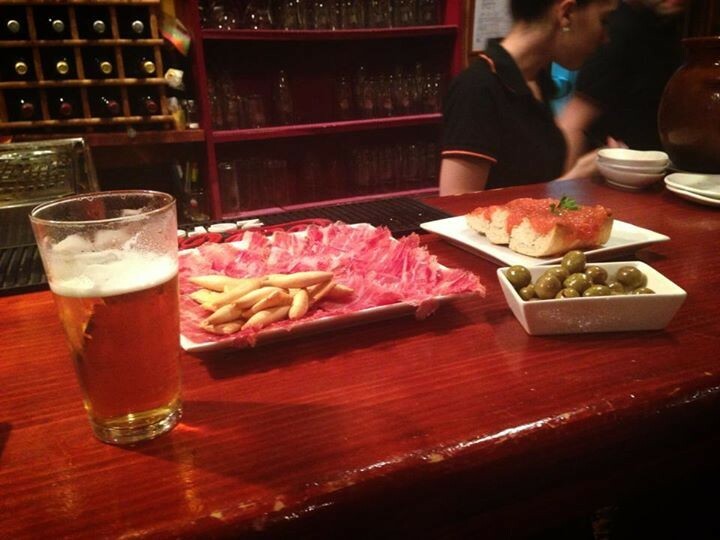 This is the true Spanish tapa place in the heart of Madrid! Is it also located next to another square called Puerta Del Sol. This is a great square as well always filled with people. You can find lots of vendors on the street in these areas trying to sell you items and a lot of street art. There’s an artist who does street art and one of his artworks is in this area. It is of a man proposing to a woman, his sign is Yipi Yipi Yeah. Buen Retiro Park- this is a very fun place to go and walk around. There’s a big pond where you can rent paddleboats and paddle along the lake. It also has a gorgeous monument in front of the pond. There are also many gardens in this park to walk around. It is a great place to have lunch and bring a picnic or sit and study. It is a very beautiful area. Museo Nacional Centro de Arte Reina Sofia- this is the queen’s museum. This is another great museum which holds many of Picassos paintings and many other famous artists. 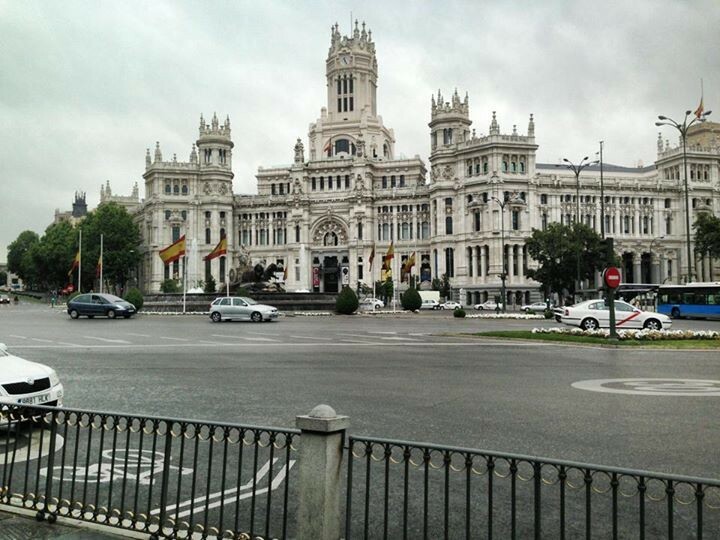 Plaza de Cibeles y Plaza de Neptuno is a beautiful square to see. When Real Madrid wins, this is where they come to celebrate. It is infested with hundreds of people chanting and going crazy that their team just won! 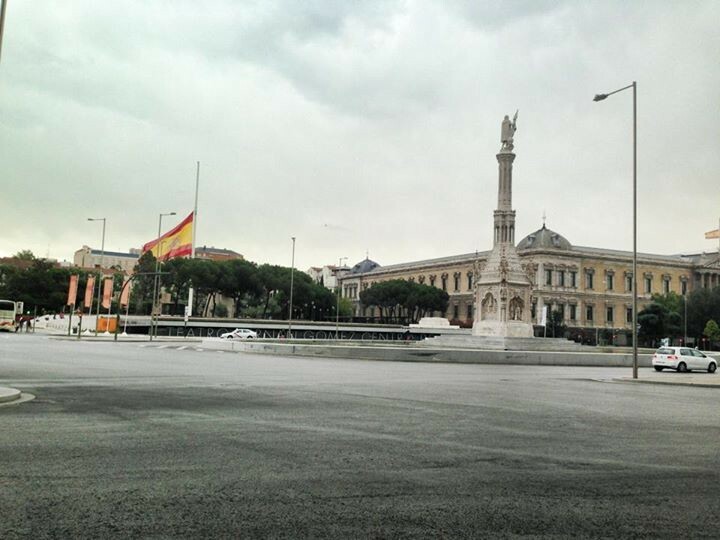 There's also Plaza de Neptuno, where Atletico fans celebrate their victories! Museo Nacional del Prado has artwork dating back to the 12th century. This museum has collected artwork from the Spanish Royals. The collections include many famous artworks from famous Spanish painters. This museum is amazing and is the first one you should see! If you don’t have that much time in Madrid I think you should definitely put this on your list. WHERE TO EAT. Some great places, unfortunately I did not spend as much time in Madrid as I would have liked but I did find some good spots! Federal café- there is also one in Barcelona and this café is amazing! Great for breakfast, lunch or brunch! The food is so good you will want to come back for more! Great coffee and drinks! Cafelito- this place is great for coffee. It is very cute and has a lot of good things! Get coffee and some cookies, yum! Goiko Grill- This is a great hamburger place! They are very good and great prices! Toma café- another cute little café with great coffee! Chocolateria san gines- great place for some authentic churros and chocolate! The famous desert in Spain and this place is amazing! La chelinda- great Mexican food! This is different and very good if you don’t feel like eating any more tapas! Celicioso- this place is amazing, it has so many different cakes and desserts to chose from! I like this bakery because it is also gluten free and some things are vegan. Amorino- this place has already made a name for itself all around the world! 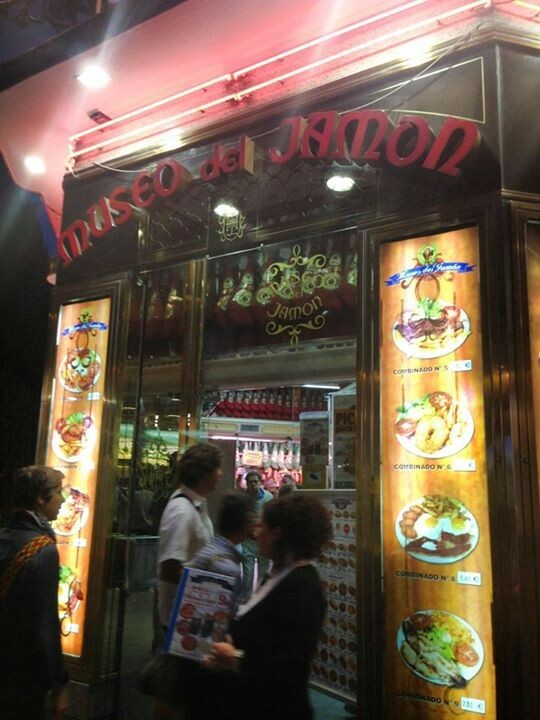 With many stores around the world it is only fitting that it is in Madrid as well. This place has amazing gelato as well as macaroons! The gelato is always shaped in a flower and it’s so cute. Mistura- another great gelato place! Has crepes and other items as well! Da Roma is another great gelato place! You can try everyone while you are here and decide which one you like the best haha! Afri’s Cookies is a very cute place to go and try all the kind of cookies they have! Its great for gifts as well! The place is very cute and the treats delicious! Do you know Museums in Madrid? Share your opinion about this place. Juana la Loca Restaurant à Madrid,Espagne. Spanish lessons in small groups in Sol with fully qualified native teacher!